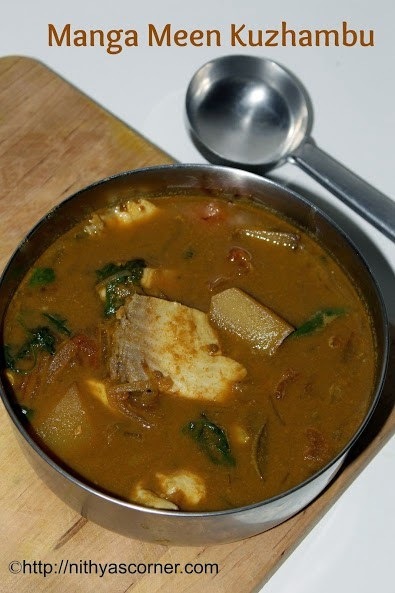 Fish simmered in tamarind juice! Nothing less than fantastic! I learned this recipe from a friend. 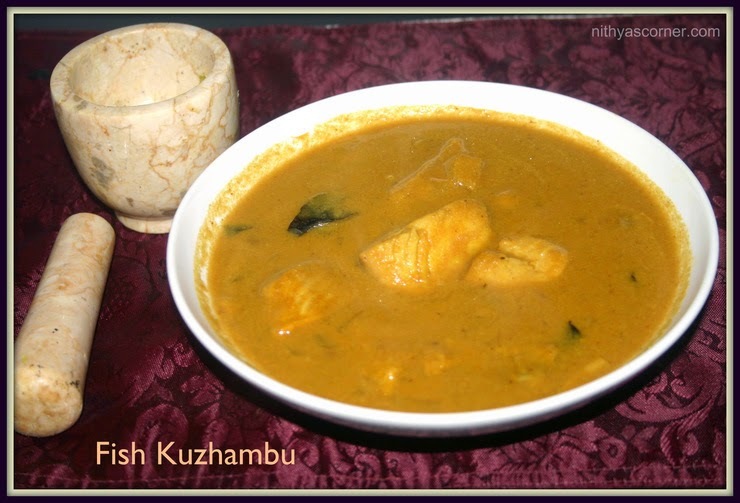 Chennai Fish Kuzhambu needs only basic ingredients such as ghee, tamarind paste, and poppy seeds. I believe the key ingredient is the ghee. A hint of ghee gives this kuzhambu its tangy and subtle flavor. I boiled this kuzhambu for about 5 minutes and then thought whether I had made a serious mistake of trying this recipe. I was also wondering how can my friend be wrong…why would she even tell me if it had not come out well for her? While all this was going on in my head, my husband was eagerly waiting for this delicious kuzhambu. The name Chennai Fish Kuzhambu itself created a huge expectation in him. He was very hungry too. I seriously thought I made a mistake. Believe it or not, as time passed by, say after 10 minutes, the smell of the ghee together with the tamarind paste gave away good aroma as well as the desired taste. The kuzhambu, at the end, tasted fantastic. We had the kuzhambu for the next day as a sidedish for idly. Fish Kuzhambu usually tastes well the next day. I thank my friend for sharing this fantastic Chennai Fish Kuzhambu. Even now, when I think of this kuzhambu, my taste buds go high. 1. In a mixing bowl, put fish, onion, and tamarind water. 2. 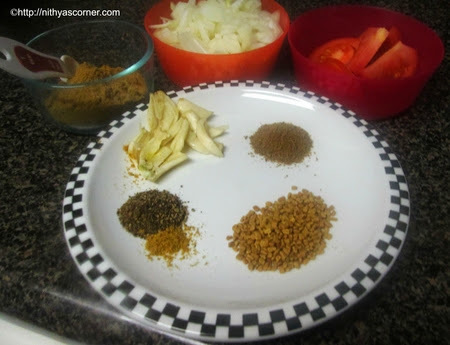 Grind cumin seeds, garlic pods, poppy seeds, mustard seeds, chilli powder, and turmeric powder into a fine paste. Add this paste to the mixing bowl. Stir once. Transfer the content to the frying pan and add salt. Stir once. 3. Heat the frying pan. Add ghee and little water and boil well until the kuzhambu thickens. Once the kuzhambu thickens, the taste would be very nice. Now, Chennai Fish Kuzhambu is ready! Serve: Hot Rice, Dosa, and Idly. Apply 2 teaspoons of vinegar or 2 teaspoons of thick tamarind juice or even juice of half lemon on both the sides of the fish for few minutes. Then, wash the fish. This will help to clean the fish and remove the odor from the fish to a certain extent. This entry was posted in CURRY & GRAVY FOR RICE, Seafood on November 20, 2014 by vikashbhardwaz. 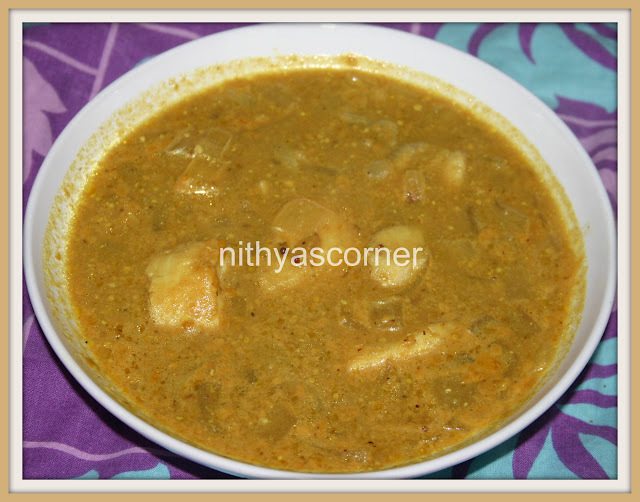 Sambar Onions/Shallots – 1/4 Kg. Garlic pod (Poondu) – 1no. 1. In a heavy bottomed pan, heat sesame oil and add mustard seeds. When mustard seeds splutter, add coarsely crushed peppercorns, cumin seeds, fenugreek seeds, garlic pod, and curry leaves. Now, add sambar onion/shallots and fry till it is almost cooked. Add chopped tomatoes. 2. Fry till the onions and tomatoes blend well. Add tamarind paste, and boil well until the mixture becomes a thick consistency. If you think you have added tamarind paste more than required, add 1/2 glass of water. 3. Now, add slitted green chillies, chilli powder, turmeric powder, and coriander powder. Boil well till its raw smell goes off. When the kuzhambu has boiled well, add the fish pieces to the boiling kuzhambu and add salt. Boil for 5 minutes and then switch off the stove. Now, Chettinadu Fish Kuzhambu is ready! Serve. Rice, Dosa, and Idly. 1. Apply 2 teaspoons of vinegar or 2 teaspoons of thick tamarind juice or even juice of half lemon on both the sides of the fish for few minutes. Then, wash the fish. This will help to clean the fish and remove the odor from the fish to a certain extent. 2. 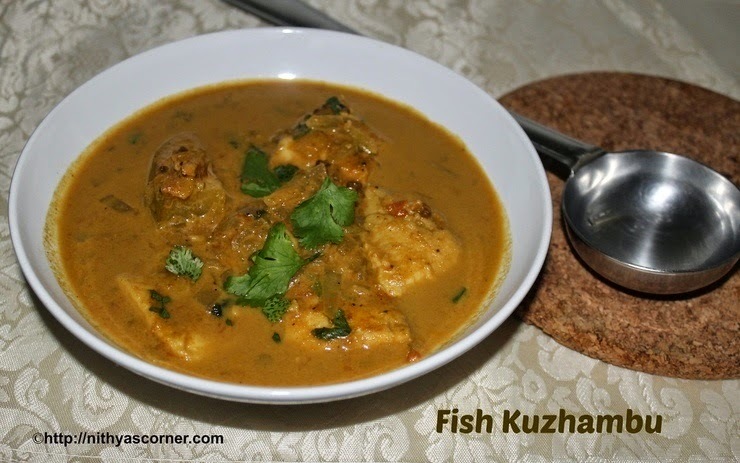 Fish gets cooked faster so allow the kuzhambu to boil well. Add the fish pieces just before the kuzhambu is done and boil for 5 minutes. 3. If you cook and eat it on the next day, the kuzhambu will be even more tastier. A spicy and tempting kuzhambu! I seldomly get dry fish at stores here. I learned this recipe from Chef Dhamu and gave it a try. Since I do not get dry fish often, I would always like to choose the best recipe and try it out when it comes to dry fish. 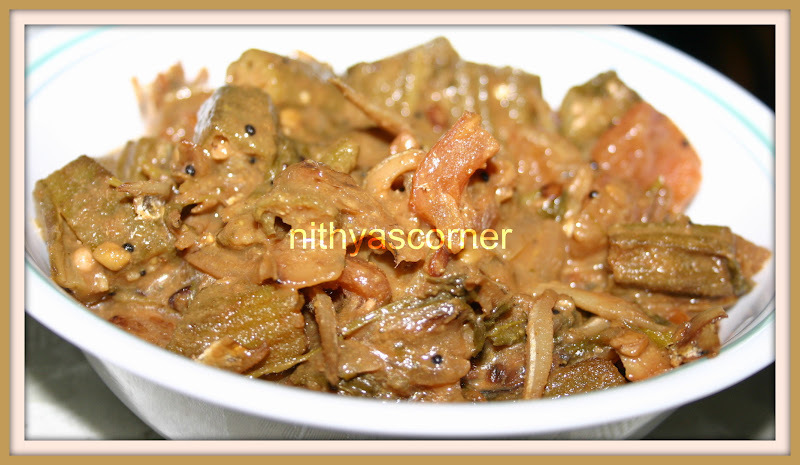 One such recipe is this Dry Fish Lady’s Finger Kuzhambu. It has a very tempting taste. It turned out to be a favorite dish in my family. My friends also tried the same and told me that it came out very well. So, just give it a shot and very soon you would add this dish to your favorite recipes list. Thanks to Chef Dhamu for sharing this tempting kuzhambu. Chopped onion – 2 nos. Red chillies – 3 nos. 1. Marinade dry fish for 1/2 hour using turmeric powder and salt. 2. In a pan, heat oil. When oil is hot, put mustard seeds. When mustard seeds crackle, add urad dal, fenugreek seeds, red chillies, curry leaves, and onions in an order. 3. When onions turn transparent in color, add green chillies and ginger garlic paste. Fry until the raw smell goes off. 4. Now add lady’s finger, tomato, chilli powder, coriander powder, and water. Fry well. 5. Then, add salt, coriander leaves, and tamarind water. Boil well. Finally, add dry fish and boil for 3 minutes. Garnish using coriander leaves and curry leaves. Now, Dry Fish Lady’s Finger (Nethilli Vendeka) Kuzhambu is ready!! Serve. Rice, Idly and Dosa. A traditional and delicious Fish Kuzhambu! I have tried several fish kuzhambu dishes. More or less, I liked almost all the dishes. I learned this dish from my close friend and wanted to share the recipe here. This kuzhambu tastes well when the tamarind juice blends well the coconut flavor. For those who do not like the coconut flavor, do not worry…the tamarind paste will overcome the coconut flavor, and I am sure you would not be able to find the coconut flavor unless or otherwise someone tells you. Definitely, a must try dish for someone who loves Fish Kuzhambu. Onion (chopped) – 1 no. Tomato (chopped) – 1 no. 1. Marinade fish using turmeric powder and salt. Keep it aside for 5-10 minutes. In a blender, add 3/4th of chopped onions, tomato, and coconut. 2. Grind them to a fine paste. Add turmeric powder, chilli powder, and coriander powder. Grind again. 3. Add tamarind juice to the ground onion tomato paste. In a pan, heat sesame oil. Add fenugreek seeds and curry leaves. When fenugreek seeds turns golden brown, add onions and saute till the raw smell of onions go off. Add little salt. 4. Then add the ground (onion tomato tamarind) paste and boil well till the raw smell of the paste goes off. Boil for at least 15-20 minutes. Then add fish with some water. Add desired amount of water if the kuzhambu is thick. Cook the kuzhambu till the fish is cooked. Now, Fish Kuzhambu is ready!!! 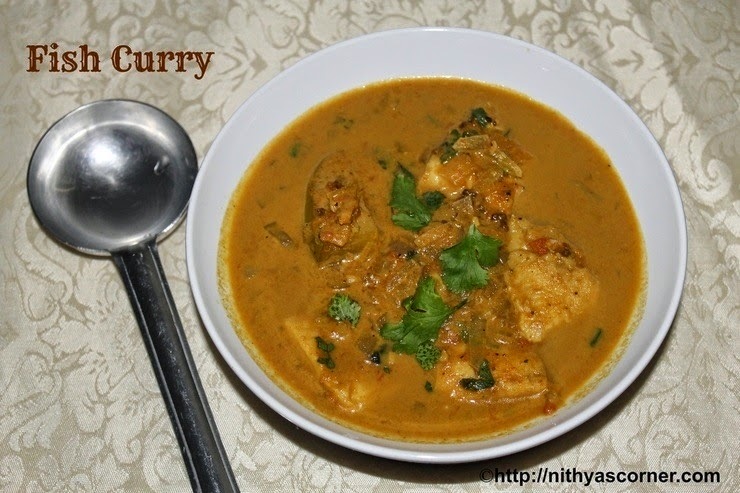 This entry was posted in CURRY & GRAVY FOR RICE, Seafood and tagged Chettinadu Fish Kuzhambu, Fish Curry, Fish Kuzhambu, tamarind paste, Turmeric Powder on November 20, 2014 by vikashbhardwaz. My thatha loves my mom’s fish kuzhambu very much. Though my mom adds vegetables like lady’s finger, mango, brinjal etc. her fish kuzhambu recipe remains the same. I also like her fish kuzhambu very much. My father loves to eat fish often so this is a dish that my mom makes at least thrice a week. I am not bored of having it again and again. Before my marriage, I did not get the time to learn the recipe from her. After my marriage, my husband requested me to learn the Fish Kuzhambu from her. May be he wanted a change from the regular Fish Curries I make like Chennai Fish Kuzhambu, Chettinadu Fish Kuzhambu and other versions of Fish Kuzhambu. After having Sanvi in our life, our intake of fish has increased a lot that’s because Sanvi likes fish. Sanvi prefers Simple Fish Fryand this Fish Kuzhambu. Even this afternoon, she had Simple Fish Fry . Have to wait and see if Shreeya is going to join us. Garlic cloves – 12 nos. 1. Heat oil in a pan and add fenugreek seeds and garlic cloves. Now add chopped onions. 2. When onions turn transparent, add saunf and cumin powders. Fry for 3 to 4 minutes. Add turmeric powder and chilli powder. Saute for a minute, add tomatoes and then finally add coriander powder. Sauté well until the raw smell of the powders go off and tomatoes turn mushy. 3. When the raw smell goes off, add 1.5 cups of water and boil for 3 to 4 minutes. When the mixture thickens, reduce the flame to slow-medium and add the fish. Boil for 5 minutes. When the fish pieces are cooked, garnish with coriander leaves, stir well for one last time and serve. Now, Fish Kuzhambu is ready! I love Fish and Raw Mango combination very much. My paternal grandmother makes Raw Mango Fish Kuzhambu very often. My grandparents lived right opposite to a lake so they ate fishes most of the time. Whenever we visited her, she would make this Raw Mango Fish Kuzhambu. Sometimes, she made yam fish combination and sweet potato fish combination. She passed away three years back. Apart from missing her, I also miss her yummy Raw Mango Fish Kuzhambu. Though I did not learn the recipe from her, whenever I made Fish Kuzhambu at home, it will only bring nostalgic memories to me. I learned this recipe from Chef Dhamu in a television show and tried it out three days back. Wanted to post it right away so that you can also enjoy the taste of fish kuzhambu. 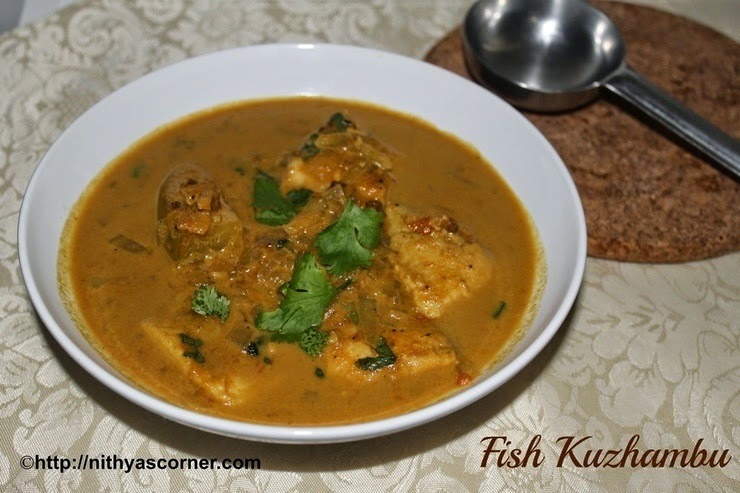 Very easy to make and preparation varies lightly from the normal Fish Kuzhambu. 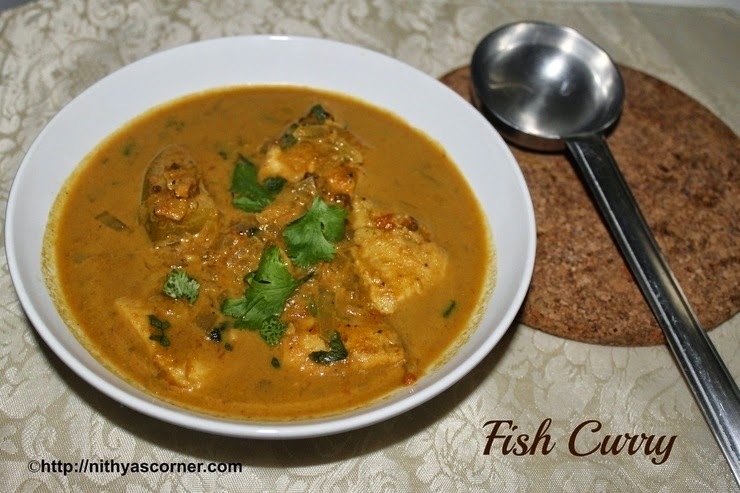 I know I have posted few recipes on different versions of Fish Kuzhambu like Chennai Fish Kuzhambu,Chettinadu Fish Kuzhambu, Fish Kuzhambu,Fish Kuzhambu – Amma’s Recipe, but this one stands apart. Now it is the season of mangoes, so just try this combo and you will like it. Raw mango – 1 no. Garlic Pod – 2 nos. Red Chillies – 2 nos. 1. In a mixing bowl, add chopped tomatoes, turmeric powder, chilli powder, and coriander powder. Extract tamarind juice using 1 cup of water. Add the tamarind juice to the mixing bowl, and combine all the ingredients well. 2. In a wide-bottomed pan, heat sesame oil. Add mustard seeds and when it splutters, add red chillies. Then add curry leaves and fenugreek seeds followed by chopped onion. 3. Fry onion for 2 to 3 minutes, and then add garlic cloves. Fry until onions turn transparent. Then add sliced raw mango pieces. 4. Fry the raw mango pieces well. Then add the tamarind paste mixture along with some salt. 5. Cook for 5 minutes and then add a cup of water. Boil well until the Kuzhambu comes to a thick or your desired consistency. 6. Add fish pieces and coriander leaves. Cook until the fish pieces are cooked. Now Raw Fish Mango Kuzhambu is ready! 1. If you serve this kuzhambu after 2 hours, it would be more tasty. 2. Apply 2 teaspoons of vinegar or 2 teaspoons of thick tamarind juice or even juice of half lemon on both the sides of the fish for few minutes. Then, wash the fish. This will help to clean the fish and remove the odor from the fish to a certain extent. 3. 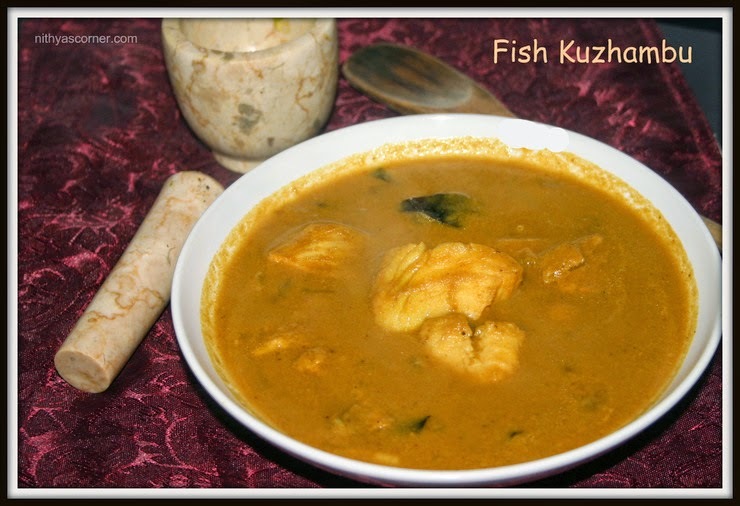 Fish gets cooked faster so allow the kuzhambu to boil well. Add the fish pieces just before the kuzhambu is done and boil for 5 minutes. 4. If you cook and eat it on the next day, the kuzhambu will be even more tastier. Prawn Curry is Gj’s favorite dish. When he buys prawns/shrimps, he would as me to make this dish. I like to eat this dish with Curd Rice andChappathi. Gj prefers to eat this dish only with Curd Rice. After eating, he would love to sleep for 2 hours (I guess prawn curry with curd rice would make him drowsy). If I want him to watch a movie with us, then I would make this dish for dinner. If I have some work to do, then I would not mind him eating this dish and falling asleep. This is a basic Prawn Curry and anyone could do this easily as the preparation is very simple. Except for grinding ginger garlic paste and deveining prawns,shrimps, there is not much work to do. This dish also goes well with Idly and Dosa. 1. Heat oil in a pan, and then add chopped onions followed by fennel powder (sombu thool). Mix well. 2. Add ginger garlic paste, and sauté till it becomes golden brown. Then add chopped tomatoes and sauté it well until mushy. 3. Add turmeric powder, chilli powder, and coriander powder followed by prawns/shrimps. Saute for a minute until raw smell of the powders go off. Then add water and let it boil for 3 more minutes. Now add curd and cook for 4 more minutes. When prawns/shrimps are cooked, add coriander leaves. Now, Prawn Curry/Shrimp Curry is ready! Wash, clean and devein the prawns well. Maximum cooking time for prawns in 7-8 minutes. If you cook more than 9 minutes, prawns would become rubbery.